Clay Gordon, as much as anyone, is responsible for the public realization (and acceptance) that Chocolate is a gourmet food worthy of being taken seriously and appreciated as one might appreciate any other gourmet food. In the past fifteen months Clay has been featured in articles on chocolate in The Wall Street Journal, People Magazine, and The New York Times' Dining In section, among other national and regional publications, and has appeared on the Oprah Winfrey Show and ESPN2's morning show Cold Pizza. 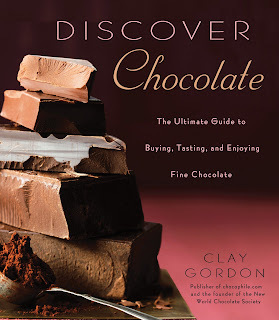 Now, Clay can proudly add the Mark and Lynn Site to this lineup as he was nice enought to conduct an email interviw with us about the past, present and future of chocolate as well as his new work Discover Chocolate (Gotham Books). MLAF: You note in your book you didn't so much become a chocolate critic as sort of invent the idea-Was chocolate really ignored to that extent in food writing? someone that their taste is bad because they don't like the same things I like? It's a lot like wine snobs who look down on people who drink white zinfandel, or people who no longer drink merlot because the movie Sideways influenced them to believe that ALL pinot noirs were superior to ALL merlots. It's nonsense. I don't think that there is any room for snobbery in chocolate and people who are proud of the fact that they "ONLY eat 70% cocoa content or higher chocolate" are, in my opinion, simply revealing the profound depths of their ignorance on the subject." MLAF: What is the best entry point for someone toexplore the finer aspects of chocolate? CG: "I talk about a chocolate tasting pyramid in my book, which is a method for quickly understanding what you like about the chocolate you like to eat. For many people price is certainly an issue, but with the chocolate tasting pyramid concept you can get started using bars that are easily available in the local supermarket or gourmet store." CG:"White goods (what you call clear spirits) are really hard to pair well in my experience. Wines and brown goods (bourbon, scotch, etc)are much easier for the simple fact that they have flavors that are complementary to chocolate." chocolate ganache, balsamic vinegar, and toasted hazelnuts in one course and scallops with a dark chocolate beurre blanc in another. At one of my book signing parties I offered shrimp with a cocoa balsamic glaze." "I think there are enormous opportunities for working with chocolate in a savory setting and in fact that's where I concentrate my culinary efforts not in desserts." MLAF: What do you think the future of chocolate is as a food that is taken seriously as a gourmet item? expensive over the next couple of years as the demand for higher quality and higher cocoa content chocolate continues to grow."